Throughout this chapter we have referred to the systematic approach analysts take to the analysis and design of information systems. Much of this is embodied in what is called the systems development life cycle (SDLC). The SDLC is a phased approach to analysis and design that holds that systems are best developed through the use of a specific cycle of analyst and user activities. Analysts disagree on exactly how many phases there are in the SDLC, but they generally laud its organized approach. Here we have divided the cycle into seven phases, as shown in figure below. Although each phase is presented discretely, it is never accomplished as a separate step. Instead, several activities can occur simultaneously, and activities may be repeated. In recent years, the study of human–computer interaction (HCI) has become increasingly important for systems analysts. Although the definition is still evolving, researchers characterize HCI as the “aspect of a computer that enables communications and interactions between humans and the computer. It is the layer of the computer that is between humans and the computer” (Zhang, Carey, Te’eni, & Tremaine, 2005, p. 518). Analysts using an HCI approach are emphasizing people rather than the work to be done or the IT that is involved. Their approach to a problem is multifaceted, looking at the “human ergonomic, cognitive, affective, and behavioral factors involved in user tasks, problem solving processes and interaction context” (Zhang, Carey, Te’eni, & Tremaine, 2005, p. 518). Human computer interaction moves away from focusing first on organizational and system needs and instead concentrates on human needs. Analysts adopting HCI principles examine a variety of user needs in the context of humans interacting with information technology to complete tasks and solve problems. These include taking into account physical or ergonomic factors; usability factors that are often labeled cognitive matters; the pleasing, aesthetic, and enjoyable aspects of using the system; and behavioral aspects that center on the usefulness of the system. 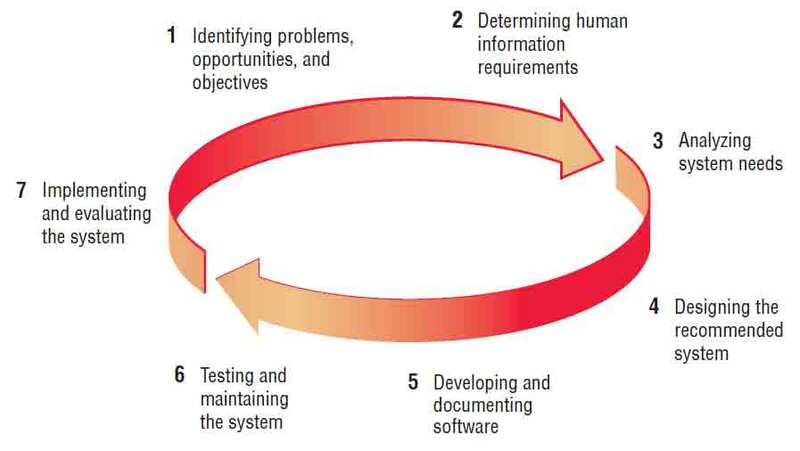 The seven phases of the systems development life cycle (SDLC). Another way to think about HCI is to think of it as a human-centered approach that puts people ahead of organizational structure or culture when creating new systems. When analysts employ HCI as a lens to filter the world, their work will possess a different quality than the work of those who do not possess this perspective. Your career can benefit from a strong grounding in HCI. The demand for analysts who are capable of incorporating HCI into the systems development process keeps rising, as companies increasingly realize that the quality of systems and the quality of work life can both be improved by taking a human-centered approach at the outset of a project. The application of human–computer interaction principles tries to uncover and address the frustrations that users voice over their use of information technology. These concerns include a suspicion that systems analysts misunderstand the work being done, the tasks involved, and how they can best be supported; a feeling of helplessness or lack of control when working with the system; intentional breaches of privacy; trouble navigating through system screens and menus; and a general mismatch between the system designed and the way users themselves think of their work processes. Misjudgments and errors in design that cause users to neglect new systems or that cause systems to fall into disuse soon after their implementation can be eradicated or minimized when systems analysts adopt an HCI approach. Researchers in HCI see advantages to the inclusion of HCI in every phase of the SDLC. This is a worthwhile approach, and we will try to mirror this by bringing human concerns explicitly into each phase of the SDLC. As a person who is learning systems analysis, you can also bring a fresh eye to the SDLC to identify opportunities for designers to address HCI concerns and ways for users to become more central to each phase of the SDLC. Chapter 14 is devoted to examining the role of the systems analyst in designing human-centered systems and interfaces from an HCI perspective.